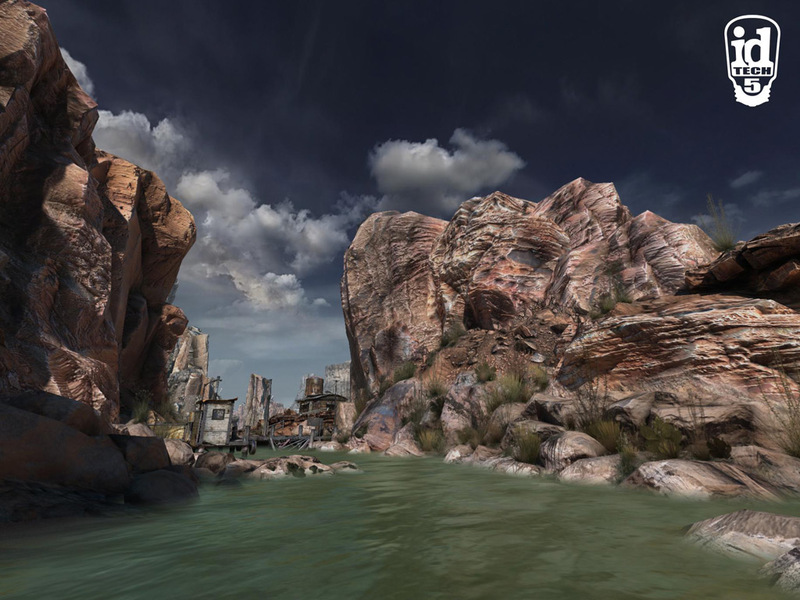 Nearly six years after id Software released Quake 3, they have returned and gone multi-platform to release RAGE, the game that has been in development for the better half of five years. Not only have they returned with a new game though they have also brought along their brand new engine id Tech 5 which adds a shadowy doubt as to how well the game will look and perform seeing as its all new technology. Have id Software really managed to reinvigorate the first person shooter scene again though after spending so long out of the spotlight, or does RAGE whimper quietly into a corner like a dog that has lost its bone? The only way you are going to find out is if you carry on reading our definitive in depth full review on the game! Being a first person shooter and coming from the masterminds that brought us Doom, Quake and Wolfenstien, it is no surprise that RAGE would have to have amazing game play to help id Software prove to the gaming world that even though they have been away for five years, they are still the masters of the genre. Well in some respects they did manage to pull off some pretty decent gameplay mechanics, but on the other hand some of them felt really lop sided and unneeded or that the game could of done without them, this is where we now delve into how the game operates and works and what areas of the game work well compared to others. Upon first glance of RAGE everything feels so in place, so finely tuned and that given the time you will be able to easily master this game just like every other shooter that is currently on the market, well unfortunately that�s not the case. The game itself is very much tied to the old school era of shooters, what I mean by this is that the difficulty is rather intense at certain parts and enemies wont just drop to the floor whilst your shooting at them, its going to take some very precise shots to drop your enemies quickly, efficiently and with ease. Not only that though, the way the game has been designed is that it will ultimately refuse to hold your hand, it wont guide you or tell you where to go. It won't even offer you the slightest hint as to what your supposed to do next apart from a mission objective, and the way some of the levels are set out are very much puzzle like, for example you may find yourself looking around the local scenery trying to find a way past a door or through a locked gate. These are rather nice touches, because even though the game isn�t completely old school in the way it handles, id Software have actually managed to take some of the newer elements from shooters such as Call of Duty and Battlefield and implement them into RAGE with an added twist. A simple walk in the life of Wellspring! One of the main twists is that when you die, it isn�t a case of you just die and you restart. You find out in the storyline that your body is fitted with a defibrillator and that when you're in trouble and you can't manage to find a place to heal in safety or you can't patch yourself up and eventually die, you will enter a meta game where you have to revive yourself using your defibrillator. This doesn�t mean to say you can't ultimately die in the game, as you only have so many chances in a certain time limit that you can use this item. The rest of the time you will need to make good use of your ammo you take your foes out with and even better use of the bandages that will heal your character back up to normal with, unfortunately though this springs two problems. The first problem is that you can't run in and treat RAGE as if your going to be spraying your ammo all over the place. If you do this your going to end up in some serious problems as ammo in RAGE is rather scarce at times and the last thing you want to do is go into a shoot out using only your fists as your only weapon of choice. If this does seem to happen to you then you may then spring into the second problem and that is healing yourself with bandages that you may have found. Again just like the ammo you need to make good use of the bandages that you find lying around or you're going to run out rather quickly. If you can�t find any bandages though you may be able to make some with items you have looted throughout the game. You may recall that I pointed out before that you will need to make good use of your ammo to take out your enemies with, I mentioned this because the enemies in the game are rather tough and not only that they can be very fast and charge up to you and attack you with some serious power. If you shoot for the body your going to end up wasting a lot of your ammo, so you really need to be trying for the head whenever you have a chance to, if you can get a clean headshot then you will no doubt save yourself a little trouble but also that precious ammo. There are many different areas that you can visit whilst your playing the game, some you will come to whilst playing missions whilst others you can go out of your way to find, one of the main problems with the game though is that the missions the game offers suffer from being very linear and not really offering the player a choice of where they would like to go or how they are going to get to there next objective easier or quicker or maybe even taking a stealthy route. Moving around the world is easy enough to do though and there are no real glitches that will stop you from progressing to where you need to go, climbing ladders in the game though could have been improved more by possibly creating an animation of your guy climbing up them, rather then just sliding up the ladder to your next destination. Finding quests and accepting missions in the game is rather easy also, all you really have to do is walk up to the quest giver and they will automatically look up in your direction and start talking to you, this will then eventually lead to an accept quest screen at the side of your television in which you can choose to accept or not, if you choose not to accept then you can either return at a later date or press A on the quest giver to be offered the chance again. As your talking to the quest givers, you are allowed to more freely around and explore within a certain distance, if you move too far away then the quest giver will automatically stop talking then start from where he left off once you return. It�s nice to see this implemented as well as it has been. The gun play in the game is rather stellar and faults are hard to come by, each individual weapon has its own system of firing and you will need to learn each system effectively to be able to take out the tougher enemies easily. Each weapon also comes with the iron sight zoom which lets you give off a more precise shot, and one of the features that seems to have been included is that with your pistol and machine gun you are given a zoomed in sight. This for me was a real deal breaker as I didn�t really want to have to zoom in with a machine gun to take a decent shot at an enemy who was moving towards me, as it takes time to not only zoom in but then to find a good shot on your opponent afterwards. If you don�t feel like aiming properly though, you will be glad to know that firing from the hip is rather effective and strangely accurate and quite often I was able to acquire a headshot with the crossbow without really trying to get one. It was nice to see that there are a few RPG elements that have been thrown into the single player, I touched upon the fact that you have to heal yourself with bandages earlier on, and these can either be found or created. This means that little things you loot whilst your playing the game, may or may not be combinable with other items in your inventory which you can create to make certain things. Maybe you will want to make a normal grenade into an emp grenade, or maybe break into sealed doors with lock grinders, or take a stealth approach and blow up enemies with RC cars. There are many ways you can combine two very different things together that will ultimately help you out in the end. If you don�t have any items that you can combine, you will be glad to know that you can also loot money in the game, which can then be spent purchasing upgrades for various things including your character, vehicles and even weapons. But you can also buy other little random tid bits as well if you fancy, like for example more clothes to create bandages for your next mission or maybe some more ammo if your running low. These RPG elements are rather nice and maybe it would have been nice if there was some sort of levelling up system that was included within the game to make the player feel like they had a more powerful character with each mission they completed. With a few of the basics mentioned though lets move onto some of the other more random elements of the game such as the meta games for instance. Whilst you're travelling you will often come across little side games that you can take part in and often bet your money on. These are nice little additions and often work well. When you get into the town of Wellspring you will notice if you take a good look around that there is plenty of side stuff to do if you don�t fancy taking on a mission at the time. You could choose from a zombie game where you have to roll dice to depend on how many zombies your sheriff will shoot, or how about taking part in some five finger fillet to name but a few. Not only are these games present in RAGE they actually work really well and at times can work too well as they can be hard to win at. Seeing as this is id Software�s first real attempt at creating something other then a shooter, and adding in the ability of vehicles that you can move and drive around in at your own pace and use for quite a lot of the story, then you will be glad to know that they do all handle quite well, the racing parts of the game also have there own unique individual twists. Not only are you able to take your own weapons into the race and cause some destruction upon your opponents, you will often find that you have a special and unique weapon sometimes that you will be able to use also which will have various effects depending on which special weapon you have equipped. With all of the gameplay elements combined for the single player, it is easy to see that id Software really have created a masterpiece for single player gaming, there are flaws but these are easily overlooked with everything that is on offer. Moving swiftly on to the multiplayer portion of the game it would be an underestimate to say that anybody who knows the history of id Software would be more then intrigued to find out what goodies have been placed in the RAGE multiplayer portion of the game. Now the problem is that there is really barely anything that has been placed in multiplayer, with the game only offering two forms or multiplayer modes some gamers may feel ripped off or cheated in some respects. Whilst there are only two different modes, each mode is completely different to the last which will help soothe that hurt even more. The first mode you will be greeted with when playing multiplayer is called Road Rage and if you have twigged onto the name yet, yes this mode uses vehicles, and more importantly then that it uses vehicles with weapons. Don�t mistake this mode for a simple race game type as it is far from it, in fact what you do get is a simple sort of checkpoint race style. The whole idea of Road Rage is to drive as fast as you can do and pick up all the markers that on are on the ground and try to earn a x5 multiplayer all whilst killing your foes and trying to get to a score of two hundred to end the game, whilst this mode may seem rather easy when you read about it, it's far from it as you have to focus your attention all around and not just on getting the checkpoints, you will also need to have good knowledge of the maps if your going to get the upper hand. 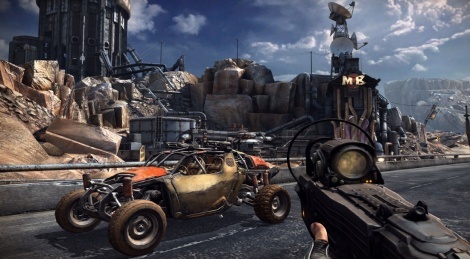 The second multiplayer mode is entitles Wasteland Legends. This is a simple format with a few different variations of game type, each different game type that you plat will have you doing various different tasks, like taking on mutants to try and raid something or even going though a horde system in the Mutant Bash arenas to get to J.K Simmons. This is easily where most gamers will spend a lot of there gaming time whilst playing multiplayer as there is more of a selection of things to do other then that of Road Rage. Even with these different game styles combined for Wasteland Legends its hard to see why they didn�t just try to make all of these there own game type styles. When playing the multiplayer of the game, id have been sure to make things a little more modern with being able to customise your player cards emblem with new unlockable logos and signs, there is also a simple experience system in place that will unlock for the player various new toys to kill with and better vehicles to use whilst playing the game. All in all what is on offer in the multiplayer section of the game is really rather tame I feel a lot more could have been put in here to help bulk it out, it�s a shame no death match type of modes were entered but I can also see and respect why id Software decided to leave them out. Whilst they have also managed to bring things into the modern day era with how multiplayer works, its also nice to see some of the old factors of multiplayer making a return. More modes could easily be inserted into the game though with future DLC and we can only hope that this is the case, as it�s a shame to see the multiplayer offering get left out like it has done, its obvious to see that a lot of the attention to the game went on the single player experience. If more modes were added in the future though I could easily see they would go on the Wasteland Legends match type system seeing as that is the closest you will get to capture the flag, horde or even just shooting things for points. Not overly sure whats going on here? Using the id Tech 5 game engine, RAGE really doesn�t disappoint in the graphics area, it would also be a safe bet to say that bar for the upcoming Battlefield 3, RAGE really is the prettiest looking game to ever grace a console. Everything about the game shines detail and lots of attention to it also. No matter if you are walking around the desolate wasteland having a stroll around to see what new areas you can find, or wandering around at a higher pace in one of the many vehicles the game uses. Or if you would like a slower pace to walk around the different towns and take a wander into a nearby bar. It really does become apparent that id Software spent a lot of time drawing up different storyboards of how they wanted a certain place to look and then actually reworking that into the main game, not only that though but everything seems to match up perfectly. Say for example you enter the nearby town of Wellspring, it�s a dusty and sandy town that seems to have been built up from scratch over the years to help house survivors and anybody that isn�t a mutant. No matter where you head in Wellspring, everything just seems to match up and have a coherent graphical factor to it. The bar looks like an old time bar and even the mayor�s office has a western twang to it. Whilst these may seem like two totally different genres, under the bright sun and dusty set up they both fit really well together. I pointed out in the last paragraph that the towns seem to have been built up from scratch; from this alone the game has a very Fallout�esc factor to it. Most structures look like metal shanty towns, and even the town looks like its seen better days. The graphical structure of the game looks to be a cross between both Borderlands and Fallout, this isn�t a bad thing though as with the added graphical powress of the id Tech 5 engine, everything just looks so much better. And with id putting their own stamp on the settings of the game world it just feels so right but yet so different. The characters in the game are all individually crafted which is a nice thing to add to the game, there are so many games out there that when you walk up to an NPC and listen to what they are saying, it just feels like they all have the same kind of face build, which at the end of the day just gets old and boring really quickly. With RAGE though as I just previously stated every NPC you come across whilst making progress in your story has a different body and face build, which helps make each individual unique and not the same rehashed character from earlier on in the story. This again just shows how much time and attention id have really spent mastering how they wanted the game to look and feel. Unfortunately though the same cannot be said for the enemies that you will encounter during the game, granted there are a lot of choices of enemy that you will no doubt be dealing with, but this doesn�t make up for the fact that there are only a few different sets of each enemy type, possibly three or four builds per a separate enemy, which when you play a game for twelve hours, can start to look boring quite quickly. Going swiftly back though to my point I made a few paragraphs ago about the NPCs that you will talk to, the animations that have been applied to the way they talk, move and even look at you have all been perfectly made. When you're in talks with a NPC whilst they are talking you will notice that the lip syncing isn�t perfect, but its pretty good for what they have tried to do, but also you will notice how parts of the facial features will also move whilst the character is talking to you. Seeing as this is the first proper game id have spent time developing vehicles for mass use in, its nice to see that the vehicle builds match up rather nicely to the rest of the overall feel of the game. What I mean by this though is that remember how I describe the towns as shanty towns or built up from scratch after the devastation that the world had been through. Well the vehicles look pretty much like this also, they look hand made and also made to be able to have modifications such as weapons and such attached to them to help make there journeys across the wasteland all that much more easier. As the vehicles take damage though its nice to see that parts of your car or quad bike will start to fall off, wheels will start to throw off sparks to show that some part of the wheel chassis has been affected. Whilst all this is a nice touch, I couldn�t help but feel that the overall fire effects that will engulf your car if it takes too much damage looked rather tame. I think a little more detail could have gone into creating a more realistic looking fire effect. Obviously being a first person shooter, many gamers will be here to take a look at the eye candy worth of firepower that the game has to offer, seeing as a lot of your time you will be wielding one of the games few weapon choices. First off I would like to point out that yes, the games choices in weaponry is rather limited, but it does do the job of supplying the player with all of the basics such as snipers, machine guns and even crossbows with more to boot. All of the weapons in the game have been given quite a lot of detail also, take for example the shotgun. Whilst it may not look like much to begin with if you take a closer look at the sides and at the top of the gun you will see markings along it, little grooves and areas that would normally get overlooked. Again this is another factor that id have spent some time and thought thinking through. They have sat down and realised that the guns will be on screen for the longest amount of time during the game, so obviously they need to look every bit as good as the rest of the game. 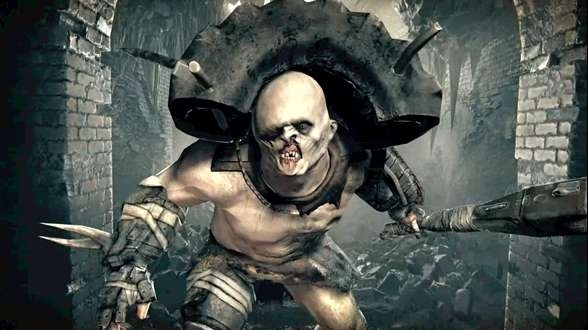 Overall it really is hard to fault the new engine that id Software have created when it comes to id Tech 5, seeing as RAGE is really only the taster of what the engine can offer to future gaming. It will be interesting to see where id take the game engine In future games. With more tweaks and power placed within it, I think we could have the most powerful engine to ever grace gaming for some time to come. All other developers should take note and realise that with time and effort every game can really look as good as this. With no graphical slipups and very rare slow down, everything about this game looks great. These little guys are fast, and when i say fast i mean run! If you remember back to our coverage of RAGE during our hands on play test where we got to play the game using Turtle Beach headsets, you may remember how we mentioned that the sound in the game was a massive factor, almost as massive as how amazing the game looked. Well after playing the game for a lot longer and witnessing so much of what the game has to offer in terms of sound quality you will be glad to know that the sound really is still a cut above the rest. Lets start by talking about the games score and the music that you will be experiencing whilst playing the game. When you're just wandering around you will get a very calm, almost ambient sound playing to you softly. Not only this though but you will also pick up on even the slightest things like walking, not only that but walking across each different terrain offers its own unique sound. I�m not talking about walking from concrete to metal either, I�m on about the difference between the sands/dirt you will walk across, be it hard or soft for some reason there is always a slight difference no matter what type of terrain it is that your walking. You have the sound of the wind that will also gently fly by, or even some kind of insects or something completely different making noises as you walk across the desolate wasteland. There are many more that could be mentioned but by now you probably get that, its nice to just sit back and be able to listen to the detail that has gone into the games sound design. When the action starts to pick up in the game, and you're met with having to fight off many enemies you will be glad to know that a heavier orchestral score will come into play. This will help keep you pumped up as you are about to go into a gun fight, one against many with the odds stacked greatly against you. It is probably also a good time to point out that the orchestral score does a very good job of telling you when an area is clear also and when things may start to pick up and be prepared for. The voice work in the game is rather decent, with many different voice actors on board it will be hard for you to notice the same voice actor playing two different characters or towns folk as you play through the game. 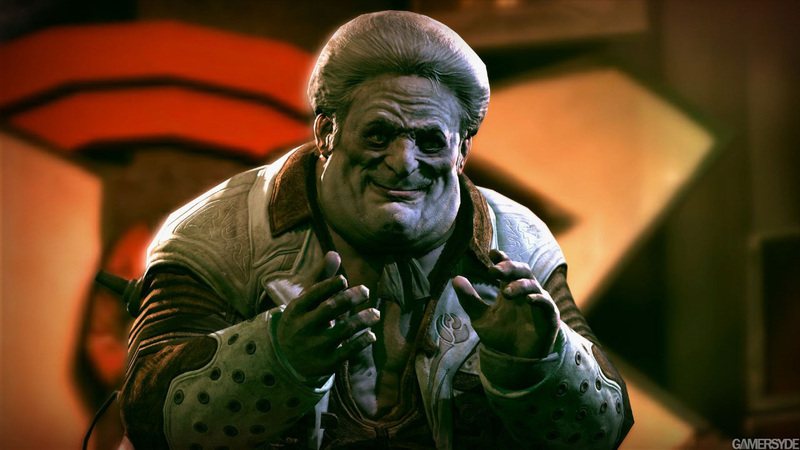 Whilst there is a lot of dialogue in the game, much of it seems to be superbly done and none of the actors give off the impression that they was forced to say a line or act like they didn�t want to be there or care about what was being said, with each line delivered in the game you got the sense of feeling that the voice actors felt almost as passionate about the game as the developers did. The major flaw when it comes to the voice acting though stems directly from the enemies in the game, very much like the character modelling, the enemies often repeat the same lines over and over again, be it the mutants who will pretty much run at you whilst screaming or the human bandit enemies who will shout obscenities at you rather then wish you a good day. Everything here just seemed so lacklustre when compared to the rest of the games sound design. I feel like it wouldn�t of hurt for id to have wrote a few more lines for all of the enemy types so that when your playing through and trying to recover from taking a beating, you don�t have to hear the same old shouts/grunts or moans. Vehicles within the game often come with a nice roary and upbeat engine sound design, if we take the quad bike for example that you earn rather early into the game, whilst it may not be the fastest or the loudest sounding vehicle that you will come across, the grunt from the bike sounded pretty decent. Now when you compare this to some of the later vehicles you find, its still pretty much the same thing. But each vehicle has its own sense of sound, be it a racer buggy type vehicle or a normal off-road car that is capable of taking a beating they all sound very different. Now onto the bit though that everybody has probably been waiting to hear about, how do the guns sound? Well just like the appearance of the weaponry in the game, you will be hard to please if you don�t actually like how all of the different guns sound, whether it be reloading the gun or actually firing away. The sound design department have done an excellent job in creating different sounds for different weapons. Overall it really is apparent that the sound in the game was taken very seriously and built up to accommodate each different setting that the game has to offer. Whether you choose to sit in a local tavern or be out battling different foes you will never hear a silent moment in the game. Granted a few things could have been changed or altered around, possibly even taken out. But what is supplied is rather good and it kept me entertained whilst playing. Most Xbox 360 players love achievements, and lets face it you wouldn�t be reading this section if you didn�t like achievements either! You are probably wondering, so how does RAGE�s achievement list stack up to the rest of the game? Well I can answer that by saying the achievement list that is features is a mixed bag, this isn�t a bad thing though it�s completely the opposite. The basic achievement list contains achievements for blasting away at the story, taking part in some of the online multiplayer aspects of the game. You even get rewarded for taking part in some of the random tasks that you may come across on your travels like taking part in meta games. There are achievements also based on racing and weapon related also, not to mention some other miscellaneous achievements that are featured. Whilst id have managed to pack 50 achievements into the game, it really does seem like they could of gone way over the limit and added even more fun stuff to do. But lets break it down though, as I said before you get a good selection of achievements for progressing through the story, whilst you may not get an amazing amount of points from these, its nice to know that your still being rewarded for completing a different and new section of the game. There really isn�t that many multiplayer achievements either packed into this game, this will no doubt come as a joy to some and an excuse not to play for others, the achievements that are on offer when it comes to the multiplayer though are rather easy and add a nice little touch to the game. There are a few cool achievements related to weapon kills which could also be associated with being misc related at the same time, you have simple ones for killing so many enemies with a certain weapon via headshots, whilst if your using the cross bow your also given an achievement for not only shooting enemies in the head with it, but also doing it stealthily without alerting them. There are a few others like kill a law officer quickly and efficiently whilst they are jet packing and before they land on the ground. With all of those other achievements though you would of thought id really would of started to run out of ideas by this stage, but that�s far from it because as I said at the start your given a few select achievements for discovering fun little things that you can find around the game world, be it finding the secret developer graffiti room or winning the max hand at a game of five finger fillet there is lots to do. Whilst some of the achievements are your run of the mill ones, there are some other decent and challenging achievements to boot which helps round out the achievement list quite nicely, nothing here will be too hard for your average gamer to get, but expect the full fifty achievements to take some time. RAGE just proves that id Software have not just been sitting around for the last five years, it shows that the creators of this truly awe inspiring game have created something truly stunning and have took a lot of time care and attention in delivering something that they truly believe in. The single player may not be the longest but it still beats many other shooters currently on the market weighing in at a decent twelve hour campaign on average, but with all the other factor like side quests and racing you will easily knock up your play time. Add in the multiplayer that the game offers, and even though its not the best it still helps to add that extra value to the game, and it makes us all eager to find out where id Software will go next and what lessons they have learned from developing this game. This game really is a must for all shooter fans out there, I highly doubt anybody will be disappointed seeing as it has a decent difficulty system and will ultimately keep you coming back for more once the story is over with.